Department of Pharmacology and Toxicology, Faculty of Pharmacy, Universitas Indonesia Depok, INDONESIA. Introduction: Colon Cancer is one of leading cancer that causes morbidity and mortality worldwide, causes 774,000 deaths. Fucoxanthin contained brown seaweed Bory) extracts showed cytotoxic activity by and study, including colon cancer. This study aims to examine the absorption profile of fucoxanthin in blood plasma on colon cancer model mice. Methods: Mice were induced by azoxymethane (AOM) and two cycle dextran sulfate sodium (DSS). Mice were given an extract of brown seaweed Bory that contain fucoxanthin. 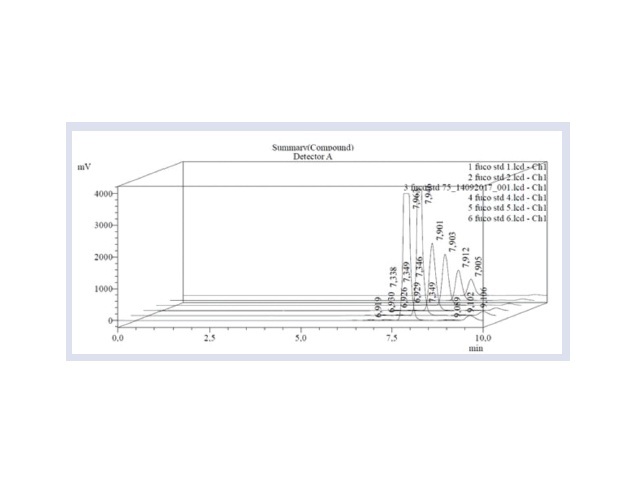 Fucoxanthin content in blood plasma analyzed using mobile phase methanol: acetonitrile by Reversed- Phase High-Performance Liquid Chromatography (RP-HPLC) analysis. Results: The maximum concentration of fucoxanthin in blood was at 4 hours after administration, and the plasma concentration is 2.15 nmol/L, T1/2 6.25 h, and AUC 10.75 nmol/L/h Conclusions: The method was applied successfully in a pharmacokinetic study and the resulting oral brown seaweed bioavailability calculated. Chromatogram of standard fucoxanthin from 25 ppm to 200 ppm. Qurrota’Ayun N, Zakaria AD, Bahtiar A. Preliminary of Pharmacokinetics Study of Brown Seaweed (Turbinaria decurrens Bory) Extract in Colon Cancer Model Mice Induced by AOM (Azoxymethane) and DSS (Dextran Sodium Sulphate). Pharmacognosy Journal. 2018;10(3):567-570.